We need to promote this site and get the word out to grow it, keep it interesting and make it more useful to the world. That is, of course, what SamTheBrand's been working on with the contests. 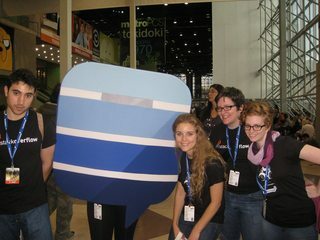 Another approach that Stack Exchange has used before is promoting sites at events. This could simply be that one of us goes to an event, Stack Exchange sends you a package of promotional things (flyers, business cards, stickers, t-shirts, that sort of thing), you go, talk about how awesome our site is to random people, hand out the promotional things, and then later write up a short blog post about how awesome the event was. If it's something where you could speak or otherwise be more involved in the event, they might sponsor you outright. If it's in their budget, they might send some of their own staff. I'm hoping for Bubbles . But we need to make suggestions for events that could make sense. There don't seem to be a lot of conferences or tradeshows that would make sense, those seem to be advocacy-focused or limited just industry people. But big rides or races where a lot of people show up would be perfect. I'll throw out a few suggestions, but other people should, too. And say whether or not it's something you'd be willing and able to attend yourself. I know some areas move the BTWW and/or BTWD around based on local things. I don't know about other areas, but typically there's lots of rest stops that get sponsored. Small rest stop is a single table, a canopy if shade is needed, a couple people, coffee, juice, food, pump and patches, etc. Bags of giveaways are typical. Freebies that are somewhat useful (patch kit, water bottle, certificate for a free tube, portable edibles, etc) are more likely to be kept, of course. Big rest stop's at more central locations have multiple sponsors and lots more going on, like pancakes being made to order. Bike home parties are common, too. At the very least, SE should do something for the New York area bike to work day. Sponsor a rest stop. Send Bubbles and a couple other people. At least some of the people on BTWD will be people really trying out riding their bike to work for the first time. They'll have a ton of "beginner" questions if they liked their ride enough. It's a good chance to get some newbies with real questions onto the site, and a good way to help encourage those people to ride by letting them feel they have a good place to turn to with their questions. I think for these you could hand out flyers to spectators. I'm planning to watch the Cycling Road races (they're free and on a weekend), also some of the Paralympic Road races (assuming I can still get tickets). Portland Sunday Parkways promotes healthy active living through a series of free events opening the city's largest public space - its streets - to walk, bike, roll and discover active transportation. Each summer, the City of Portland closes off streets to motorized vehicles, and opens them to cyclists, walkers, runners, unicyclists, and any other human-powered transportation. The event usually takes place in each of the city's 5 main quadrants, and are spaced out across the summer months. The routes always include several city parks, which are hubs for community activities during the event - food vendors, cycling companies, community organizations, etc. Individual events often have over 20,000 participants. Overall, the 2011 Sunday Parkways had 107,300 participants across all days/locations. I have no idea yet if I'll be in Portland for the summer, but if I am (or if I'm not, but am in the area), I'd be happy to help promote Bicycles.SE at one or more of the Parkways events. The event provides participants the unique and fun experience to bike through all five boroughs – a 40 mile, traffic-free ride for 32,000 cyclists. Starting just north of Battery Park, the tour runs up Manhattan, through Central Park, around a brief loop in the Bronx and down to the Queensboro Bridge passing countless New York City icons on the way. After a ride over the Pulaski bridge passing through Brooklyn, riders enjoy an incredible view from the lower deck of the Verrazano Bridge. The tour lands on Staten Island for a lively outdoor Festival, including bike demos, giveaways, games, food, product samples, stretching, massage, photo booths, and official Bike New York merchandise on sale. It's too late to get into the ride itself, except as a VIP or fund-raiser. Probably not too late to get a table at the expo at the end, though. Or to become a sponsor. This is the final stage. Start and finish in the same city. The Tour of California is the biggest professional stage race in the United States. I assume there'll be a big crowd for this. There's 3 different length rides. The majority are doing the 100 mile ride, so it's a fairly "serious" long-ride type crowd. This is the first stage. Start and finish in the same city. The Tour of California is the biggest professional stage race in the United States. If the weather is good, there's likely to be a huge turnout. There has been in previous years and that was with just the finish of the stage happening. Being on a weekend helps a lot too. I happen to live right there and could help with planning local details a bit, but I'm likely to be involved in promotion around my local cycling advocacy group and not able to help promote B.SE very much. Update: More details have come out on the route here: http://www.santarosa2012.com/ -- basic summary: starts in downtown Santa Rosa, does a relatively flat 32 mile loop with a sprint finish in Santa Rosa, then a big loop based on Levi's Gran Fondo route, then a finish in town. Looks like there's going to be various events going on around this for several days beforehand. Regional questions revisited: Should we have them? How do we handle them? How can I promote bicycles.stackexchange on a “Promote cycling” day? Attention Portlanders! Let's do Sunday Parkways!